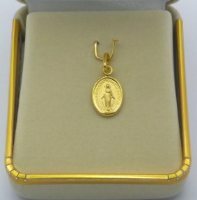 Solid Gold Catholic Medals available in 9 karat and 18 karat gold, all medals come suitably boxed in stylish jewelry presentation boxes. NO DISCOUNTS APPLY TO THESE ITEMS. Miraculous Medals and Crosses. All of our Solid Gold Catholic Medals are of the highest quality and come accordingly stamped. All precious metal items are sourced from officially registered suppliers, so please buy with confidence. Solid Gold St Benedict Pendant / Medal 20 mm.